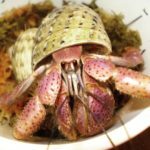 should I buy my 7yo a hermit crab? Hi, my daughter wants hermit crab, but I don't want to support an inhumane industry. What do I need to provide to make this crab happy and is there an ethical place to get one? (Yes, I know they live really long and that I'm going to end up taking care of it.) thanks! Re: should I buy my 7yo a hermit crab? The care guides here are great! They explain everything you need to know about hermit crabs and how to properly care for them. There's also lots of threads about DIY ways to set up a crabitat, crabbing can be expensive if you really get into it so we like to save money where we can. I'll say, I recommend getting at least 2. Hermit crabs are social, and one will be lonely! Also, I bought 4 from Petco. I don't like supporting the industry that treats them so poorly, but adoptions aren't in my area and at least they're getting a good life!!! Try the adoption section first, see if there's any local you can take. Welcome to the HCA!!!! this forum is FULL of amazing information, and lots of folks willing to help any way we can. If you buy everything brand new, want a stand with it, and start off with say a 29 gallon tank, which lasts two small crabs for many years before they outgrow it - you're probably looking at around $200. That would be tank, stand, lid, heater, lighting, substrate, and decor if you spend wisely. Not nearly as much as a fish aquarium, but more than some other pets. If you watch online classifieds for used tanks and supplies at a great price (sometimes free! ), it could be $50-$100 total, and that would mostly be the heater as it's hard to find those used in safe condition. Those costs are one-time, unless something breaks, and until they get too big, which can be 7-10 years down the road. Check Etsy, @TheHealthyHermit for food. It's so cheap and my crabs love it! You can also find shells on Etsy! The other question is whether a crab is 'interactive' enough for a 7 year old to not get bored (and have all the care fall to you, the parent, LOL). They can be buried for months at a time (and then you have only pet sand). They shouldn't be taken out of the tank and 'played with'. Some kids I'm sure would be just fine with these characteristics, but I know I wouldn't have been when I was 7! LOL! I have two boys, who are now 10 & 13. They love learning about the crabs with me, but I’m not sure at age 7 if they wouldn’t have lost interest a lot faster. Part of the interest depends on the crab too, since some are more naturally curious and explorative and brave lol. Dave is super friendly and tame, and I know he enjoys coming out for a visit about once a week. However- that said we don’t just let him loose either, he has a safe ‘playground’ we made for them too lol. Anyway, point is, Patrick, our other crabbie, is VERY shy. He stays buried 98% of the time. He will come out in the eve to eat every couple of days, but until I get my Wyze cameras in place I won’t know if that is all he ever does or what! To make it more enjoyable for your child- I learned about the Wyze cameras from the crabbers on here- you can put these in place and then review what they did each night right from your phone! They’re relatively inexpensive for what they are too. So that’s a lot more interesting for a kiddo, IMO. Just remember, if you get one, you’ll need more than one for sure so they don’t get lonely. Ok so I’m not an expert, I am definitely still learning too, but thought I’d share my experience with the kids and our crabbies. Good luck on your decision!